Jim and Martha Brangenberg's lives have been intertwined since they committed their lives to full-time ministry at a church youth conference. They didn't know it then, but God intended to take them on an unexpected marketplace-ministry adventure. Ever the entrepreneur, Jim started selling greeting cards door to door when he was 8 years old. "Business has always been something that was a passion for me," he said. "However, when both Martha and I committed our lives to full-time Christian ministry as 13-year-olds on July 13, 1979, at a youth rally in San Diego, California, we didn't know each other. She lived in Illinois. I lived in Minnesota. But we committed ourselves, thinking God was calling us to ministry, which He was, but it was different than what we thought." After earning his four-year degree in computer science, Jim was ready to go to seminary to become a pastor. "The Lord stepped in front of us several times to keep us from doing that," he said. It wasn't until age 40 that Jim realized his workplace could be his principal mission field. "We worked in that frustrated spot where we wanted to be in ministry, but we were businesspeople, and there was that dichotomy," he said. "I actually had a couple of deacons who trained me who said, 'Business is business, and church is church. They don't have anything to do with each other.'" The Brangenbergs—who were married in 1986 between their 20th birthdays—have owned several businesses together, including an insurance agency and a car dealership. After the workday, the high-school sweethearts helped couples with their marriages and worked with youth. Although ministering in their Evangelical Free congregation is important to them, Martha, a former church bookstore manager who says she "loves cost accounting," envisioned herself the consummate navy-blue-suited professional working in a high rise the rest of her days. But God had a different role for this exceptional couple—one they never anticipated. Although Martha also didn't fully understand how to have a ministry mindset in the marketplace, she learned about faith at work from her parents' example. "Her father was mentored by the oldest faith and work ministry out there in our country called CBMC, Christian Business Men's Connection," Jim said. "She saw her parents work through that whereas I did not." Martha's parents, Ted and Elaine Hains, believed their business belonged to the Lord and used it as "a springboard for so many things they did," she said. "They didn't necessarily have the vocabulary we have today to talk about it though, but they were living it by example." Then, for a season, her parents became career missionaries in Venezuela using their professional skills, so Martha observed them in both traditional and marketplace ministries. "My dad was a professional photographer," she said. "They owned their own studio and lab, so he photographed the mission field to document and share. Back before digital, he was bringing home the pictures to show the people in America what overseas missionaries were doing for the kingdom." But overseas missions wasn't for Jim and Martha either. "Even though we didn't understand that our work was a mission field, God just kept moving us toward that spot where we would understand it," Jim said. "And He moved us to Florida almost 16 years ago because of Martha's health. So we were living in Minnesota in a place where everybody's kind of nice, and it's hard to tell the difference between the Christians and non-Christians. He moved us down here to Florida where it's very evident, [the difference] between the Christians or non-Christians, and God just started a process almost immediately of transforming our lives." He used a powerful book to do that in Jim's life. "Within four months, a buddy of mine gave me a book called Halftime, and I read for the first time that my work mattered to God and I could have significance in my work," Jim said. "It didn't necessarily have to be a pastorate. That was the beginning of the transition that moved us to iWork4Him." The Brangenbergs believe many pastors don't realize a significant part of their role is to prepare believers for their everyday role in the workplace. "We denigrate business people, saying, 'Hey, you're out there doing evil business,' yet they [pastors] want their money, and then they will want them to serve on a committee," Jim said, pointing to a ministry called Made to Flourish, "which focuses on letting pastors know and understand that their work really is to equip the congregation for the 95 percent of their lives they live outside of the four walls of the church, not to equip them for the four or five percent they spent within the four walls of the church. It's preparing for Monday morning. It's just amazing how rampant Monday-morning atheism is among Christ-followers." After the Brangenbergs moved south, in the next 10 years or so, Jim kept coming across discipleship ministries. "God just started introducing me to ministries that were discipling people, challenging me to disciple and mentor Christian business people," he said. "One of my biggest pet peeves was the fact that I do business with people who call themselves Christians, yet they were creepy to do business with. Until 2009, the only people I ever lost money to in a business deal were people who called themselves Christians, so I knew we had a problem." Part of the problem was in the pulpit. "But when you ask people if they've ever heard a sermon that their work matters to God or if they ever heard a sermon about Jesus' reputation in the marketplace before He became a preacher, the answer to that is almost always no, they never heard those sermons, "Jim said. "And nobody's ever even told them that their work matters to God. They're all trying to figure out a way to make their work matter, like going on to be a pastor or a missionary." Or, Martha said, "making money" to support the church. The problem, in their estimation, was significant. "What I saw was a void in the hearts of Christian businessmen," Jim said. "I got sick and tired of them being one way at work and another way at night. I just felt like if Jesus is going to radically impact your life, it should be every part of your life. Those are the Scriptures I read." The process was unfolding before this exceptional couple, but they wanted to give God all the glory. "We started to uncover when we did get on the radio that there are a lot of ministries working in little pockets, but not enough people know about it to help them," said Martha, observing that they were "to help be the mouthpiece" for these ministries. The couple had no experience in what God was about to ask them to do—to share their faith-at-work message via a radio show and podcast called "iWork4Him," which is also the name of their nonprofit organization. "Martha and I were insurance professionals," Jim said. "Martha loved Christian retail. She did it for over a decade. I also have an IT background, and we weren't looking to go on the radio." God was answering their prayer requests, though. "And then I'd been praying for years about starting a mentoring ministry, and in 2012, the Lord gave me the name 'iWork4Him,' just the way you see it today. And that night, on Nov. 20, 2012, I said, 'Lord, I could see how I could mentor four or five Christian business guys, but how do you challenge thousands of people? I don't have a platform; I'm not going to be able to speak. How do you challenge thousands of people to wake up to this whole deal?'" Only 90 days later, God moved in response to that prayer. "At the last event we held before we formed the Christian Chamber of Commerce in Tampa Bay, I was speaking for five minutes on five ways to incorporate your faith into your work," Jim said. "And I sat down after speaking to the only person in the room I didn't know. She turned to me, and she says, 'Jim, you need to talk about this on the radio.'" Jim thought the idea was "crazy." After a lunch meeting to discuss the proposal, the Brangenbergs learned radio time would cost $200 an hour—which gave them pause. Jim wanted to decline, but recalled their three specific prayers: "No. 1, for a life of significance in our work; No. 2, for a job where nobody could ever say it was us and our talents in that job; and No. 3, for a way to challenge thousands of people at a time to live out their faith in their work. "In the natural, it didn't make sense, but," he said at the time, "'I think we're supposed to say yes,' and literally, we went on the air two months later, and we've been on the air for almost six years." During the Brangenbergs' third week on air, they employed that approach, and by the sixth week, phone calls started coming. As it turns out, Jim's insurance background paid off in his radio work. "I've been interviewing people for decades because I was an insurance guy," he said. "You have to interview people in order to sell insurance well. So that was how we adopted the model we use. And we knew the Lord was telling us that this was, one day, going to go national, and so we started interviewing people all over the country." 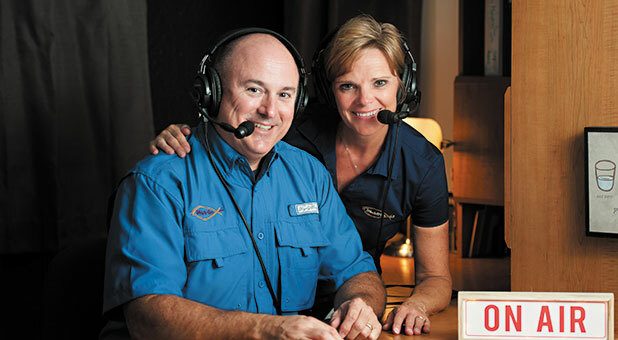 After 15 months, Martha joined Jim one day a week on air. Then, two and half years ago, she started appearing on the show with Jim a full five days a week. God has moved to help the "iWork4Him" show expand its reach. The show originates on a Salem Radio Network station and goes to other stations from there. The program has a growing number of sponsors and supporters and airs on iHeartRadio, Talk America Radio and many other sources (iwork4him.com). "He has provided miraculously for our needs and our expansion," Jim said. "Our monthly budget has gone up every month. And God's provided for us personally because the radio show still does not provide for us consistently, but He has provided in other ways. We still do marriage retreats—we love that. Marriage mentoring is our hobby. Some people golf; some people collect seashells. We love to do marriage mentoring." One or both Brangenbergs have interviewed almost 2,000 people on the show and have done over 1,220 shows. Although Jim said it's hard to pick his favorite interviews from the many they have done, he points to one Florida businessman, Skip Stanton of Aqua Plumbing & Air, now a sponsor of the show. Before Stanton started his own business, he was an appliance repairman at Sears. "The guy he worked with at the appliance repair counter said, 'Hey, I want to buy you lunch today.' During lunch, he shares the gospel with Skip, and Skip goes home and says to his wife, 'Hey, I don't think we're Christ-followers. We need to think through this.' And it transformed his business. "He has a phenomenal reputation 25 years later for running his own heating and air conditioning business in Sarasota, Florida, and it was all because of a friend being willing to reach out to him in his work." Martha added that one of her favorites was Diane Paddison from 4word. "She has women's groups in 27 different cities across the country, really just helping business women apply biblical principles in all areas of their life," Martha said. "She has been an inspiration to me because she was in corporate America, and she shares how God taught her so many lessons about including Him in her work." The Brangenbergs are also encouraged by many listeners who write to the show, saying "'I have to do my job, but I'm doing it with a different perspective,'" Martha said of those in the workaday world. "Those responses are why we do what we do on the radio every day." The Brangenbergs challenge their listeners to join the iWork4Him Nation with a pledge to look at their workplace as their mission field. "It's a commitment to the Lord," Jim said. "It has nothing to do with the show. It's not a club. There's no money involved. It's been treated like a covenant they're signing between them and the Lord. It says they're willing to be a change agent in the workplace, looking for ways to pray for the people they work alongside each and every day, looking for ways to serve them over and above what their job requires, looking for ways to befriend them outside of their workplace. It's all about being a person of excellence because it's our opinion that every Christ-follower should be the No. 1 employee in their position in their workplace. They should be setting the standard for excellence." And it's not only people in the U.S. who join. "We've had people join from about a dozen countries besides the United States," Martha said. "This isn't a message that only resonates with Christ-followers in America." Jim shared a long email he received from a Namibian in South Africa. "He said, 'Jim, I was looking for Trans World Radio, but I ran across your ministry because you were interviewing somebody from Trans World Radio. Nobody's ever told me that I should be praying for my boss. This is transformed how I work. It's transformed how I live. I can't tell you what a big impact this has made in my life.' We get emails like that from all over the world all the time. ... And we don't have a marketing budget, so God does the marketing." The Brangenbergs are always looking for great faith-at-work stories, whether from America or abroad. "If somebody knows of something that has really inspired them, a story of somebody of what they're doing in their workplace, then they can definitely use our contact page to reach out to us," Martha said. "We want to lift up what God is doing in places across the country," Jim said. "And that's our goal: to lift up, No. 1, what are the ministries out there that people can use as resources to dig deeper into their faith and connecting what they hear on Sunday with what they do in their 9 to 5? Then we want to highlight the stories of people in all different kinds of jobs all over the country. So our goal is to lift up what's going on the kingdom to inspire other people to do the same thing in their workplace." The Brangenbergs clearly take the faith-at-work lifestyle seriously, as can be seen in a recent commitment they made to help a former colleague. "Because of a workplace situation, a long-term friendship in Minnesota, Martha and I had the opportunity to donate one of my kidneys in December to a friend, somebody I worked with in the '90s," Jim said. "It was very cool. We hope to be able to use our platform to help promote living donations in the future, if that's what God wants. But it was an incredible journey to go through all of that." It was a direct match, "right from him to a friend," Martha said. "He was an amazing match, which is just crazy but wondrously good." Listen as Dr. Steve Greene explains how you can change the world for Christ without ever even leaving your job.